It’s official: The industrywide property portal debate has devolved into a full-fledged circus of back-biting executives and partisan practitioners baying and barking back and forth on whatever stage has the suitable bandwidth. From article comment threads to industry conference panels, everyone has a take on what lies ahead for listing properties on the Internet. And somewhere in the middle of this proverbial Maury Povich episode lies what’s best for real estate agents and the homebuying public. And because buyers still use desktop browsers more than any other interface to look for homes, ensuring online information is clean, accurate and easily obtained remains as critical as ever. 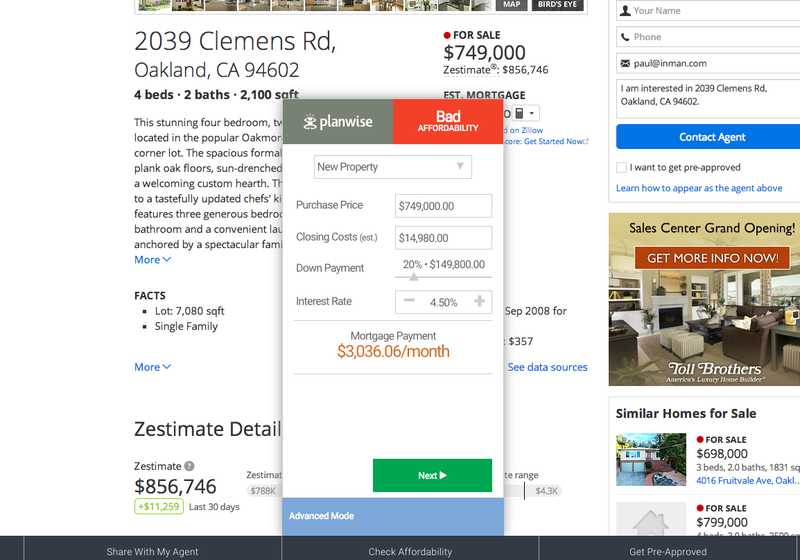 However, until that’s sorted out, maybe a little browser extension from PlanwiseConnect can help agents stay in front of clients when they search for properties on the Internet. I know an agent here in Las Vegas running a local radio ad questioning the veracity of Zillow’s now infamous Zestimate. Like a calorie counter on a gym treadmill, Zestimates, monthly payment estimates and any other form of portal calculator type, are simply using a broadly questionable list of assumptions to deliver consumer real estate data. 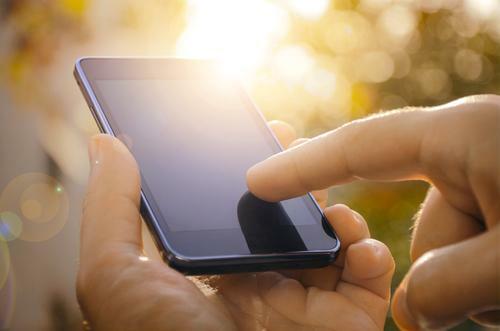 But when an agent sends their buyer client the link to the PlanwiseConnect toolbar, the client has at his or her disposal a detailed, personally relevant housing expense tool. After the user completes an initial financial profile, Planwise plugs that data into the ownership costs of whatever property they peruse on any of the major listing sites. 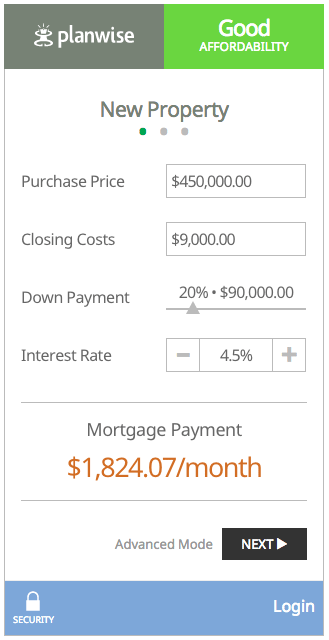 New “simple” view of Planwise’s affordability tool. 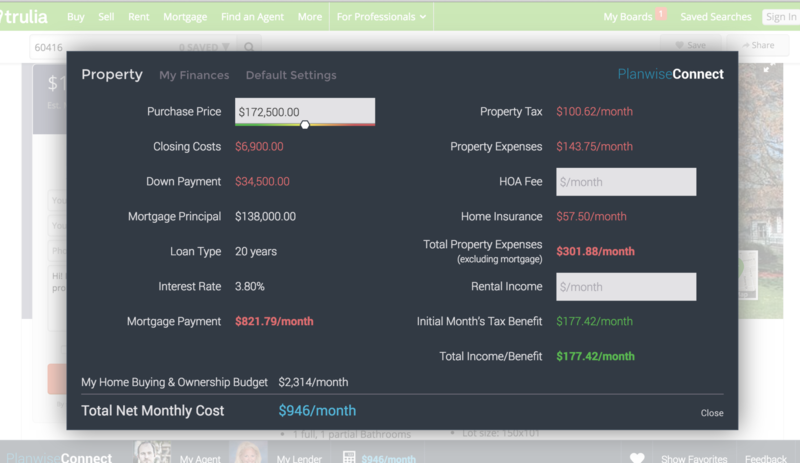 The calculator pulls in sales price, homeowners association (HOA) fees, interest rates, closing costs and all other relevant homeownership expenses published on the listing, and then it juxtaposes them with the user’s profile, which consists of items like down payment, available cash, net income, monthly payment preferences — even rental income if getting a roommate is an option. Fields can be tweaked if needed, and users can create different financial scenarios as they go. 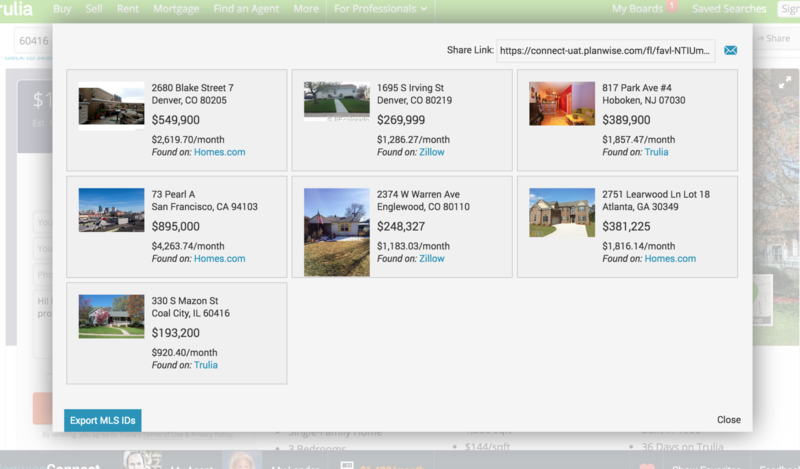 The toolbar, appearing on the bottom of the browser window, shows the agent’s face and name, and offers a chat window for the user to ask questions or request a showing for that property. Client users also have the ability to create lists of favorites based on URL and using the financial data for each, create an accurate comparative cost analysis of the properties they like. Agents can export the MLS# of each for verification. Agents can choose to include the profile of a local lender partner in their toolbar so their clients can also keep them in the loop on properties that spark their interest. The portal wars have unquestionably made it more difficult for consumers to get accurate information, despite the clear intention to do otherwise. Worse yet, consumers aren’t aware. In the race to sell ads around data, we stopped caring about the data. Agents are also having to work harder to maintain their relationships. While there’s nothing inherently wrong with that, the implicit support of client disloyalty on the part of the portals isn’t helping the industry in the slightest. PlanwiseConnect takes the top concern for homebuyers (affordability), adds value to it, and gives it to agents as a support tool for maintaining relationships. Clearly, Planwise is very much just that, a supportive marketing bolt-on to your broader outreach plan. To get the most of your $199/year Planwise account, agents should connect the link to the extension on just about everything they do, from email marketing to social media profiles. I’ve made it clear in prior columns that I like software with a specific purpose, solutions that target an obvious need. PlanwiseConnect meets this qualification. PlanwiseConnect also looks great. For a financial calculator to make me want to interact with it, it has to be this well-designed. It’s simple to use, fast for the user, and, best of all, provides accurate information. The amount of misinformation and generalizations about real estate that have bled from the battlefield of the portal content wars is leaving in its wake an informationally anemic homebuying public. Maybe PlanwiseConnect is the little infusion of market intelligence agents need to ensure their clients remain on this side of the market. Do you use PlanwiseConnect? What do you think? Leave a comment and let us know!